The 2016 MSJ Prize for Excellent Applied Mathematicians was awarded to Dr. Akito Suzuki, Associate Professor, Faculty of Engineering. 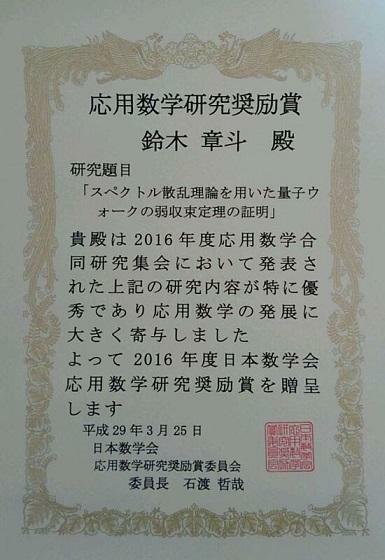 This prize was founded by the Mathematical Society of Japan in 2013 intended to facilitate the research in applied mathematics, the academic exchanges, and further development in this field. It is awarded to those of age below 40 who have accomplished outstanding results in the field of Applied Mathematics. The award-winning thesis is "A spectral and scattering theoretic proof of the weak limit theorem for quantum walks".